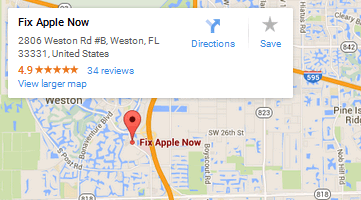 Below you can find driving directions from Google Maps to help you get from Miramar to your nearest Fix Apple Now store, situated in Weston. You can either copy the driving instructions below or click here for a larger map and driving directions. Talk to Fix Apple Now if you have a broken iPhone 4, 5 or 6, iPad, iMac, MacBook Pro or Air or iPod in Miramar. We pride ourselves on offering high-quality Apple repair services for some of the best prices in the region, so why head anywhere else if you need to mend, fix, repair, replace or change your Apple device. Some of the most common issues we deal with include boot loop, crashing apps, broken and frozen screens, unresponsive touchscreens and features like Touch ID and Bluetooth not working. Our engineers are amongst the most talented and knowledgeable that the industry has to offer, so why not call today? We always aim to fix and get your device back to you as soon as possible so you only have to be without it for a short period of time. We can help if you need to fix your iPhone in Miramar. You can get in touch with us at any time if you have any queries about our services, so why not do so right now?